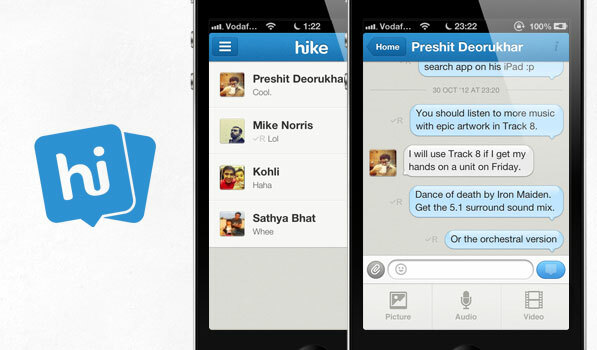 We featured Hike’s Android app a while ago and for its lovely design and features. The company claimed their iOS app was coming soon and it was just released. They did not disappoint. Everything from the sign up page that asks for your number to register to the chat bubbles makes you want to use this app more. The help screens guide you through the app and its features and you’re ready to go. It has a nice cards layout with brilliant subtle patterns. Tapping the option button on the top left lets you share the app, view and edit your profile, view free SMS and check the help page. I’m really surprised that this view can’t be brought by swiping instead of pressing the button. The colours used just hit the right spots. Contacts that have hike installed are indicated with a blue chat icon while non hike users have a green chat icon like in iMessage. The conversation page has a very non cluttered look and the delivered and read receipt icons next to messages go beautifully with the background colour. They aren’t distracting at all. There’s a great animation for transferring media as well that slides the text field down and back up revealing 3 buttons. You can send images, videos or audio clips from here. Each conversation view also has an information button on the top that shows you the recipients profile and gives you an option to block the user. Hike also has a huge set of custom emoticons that can be used. I’m not a big fan of them as they look too rough compared to the Emojis we are used to now. Hike’s other selling point is the ability to SMS non hike users through its built in SMS gateway. This feature is only available in India and inviting people to use the service adds to your monthly free SMS quota. Hike is a brilliant change from the typical messaging apps on iOS. It is designed really well and has very few negative points. The lack of swiping gestures to navigate is a little surprising given that almost every app that uses this design language has them. I’d like to be able to change the default alert sound for messages in a future version. I’m shocked that there isn’t a way to sort contacts by hike and non hike users at this point. The notification system works really well and after testing the app for a few weeks, I’m glad that the final version in the App Store has almost no issues. Hike is now on Android, Windows Phone and iOS. Apps for Blackberry and Symbian are coming soon. The app aims to compete with WhatsApp. Once the app is on all platforms one can only hope users switch over since it matches WhatsApp on features and adds more along with gorgeous looks. Hike is available on the App Store for free. The app is available only in India right now and the company is planning a global launch very soon. Update: Hike messenger is now available for download across the global App Stores. Here’s the link.